NEW IN! 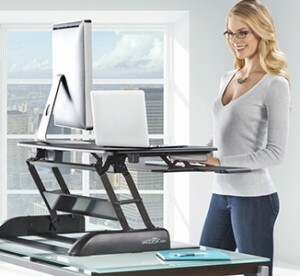 Great new products from VARIDESK, RH chairs and more! This entry was posted on August 8, 2014 by Posturite. This month has seen some exciting new products landing on our website from some of our favourite brands. Our latest product is the RiteBar which we previewed at the Safety & Health Show a couple of months ago. The RiteBar is an ergonomic roll-bar mouse that sits in front of your keyboard, eliminating the need to reach for the mouse, which can stress your neck, shoulders and elbows. See our video below for a product demonstration. Following its recent launch, we now have the RH Mereo task chair from RH chairs available to purchase. There are four chairs in the collection, all are designed to give everyone a sitting experience as if it was custom made. They are easily adapted for everyone, whatever your size or shape. Top features include tilt resistance and dynamic lift, and are available in black or silver with a high or medium back. Another of this month's exciting new products come from VARIDESK , we now have the VARIDESK Single Plus and Pro Plus adjustable rising desks and The Mat - an anti-fatigue mat that cushions and supports your feet, knees, hips and back as you work - the perfect companion to your VARIDESK! The VARIDESK Single Plus is an adjustable riser that sits on top of your existing desk, allowing you to switch from a seated to standing position quickly and easily, The Single plus is designed for smaller workstations and those with single monitors. The Pro Plus is the perfect size for workstations with dual monitors or docking stations. 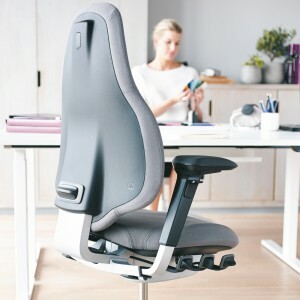 Both the single and pro plus feature a new lifting keyboard tray which ensures ergonomic comfort for your arms and shoulders whether sitting or standing. You can view our new VARIDESK products here. The VersaStand is extremely versatile, it can flip 180 degrees which enables you to view your tablet on your desk flat as if though it was in your hands to vertically, allowing you to set it up on your desk to use it for a second monitor, surfing the net, Facetime, watching films and much more! With great reviews from tech whizz kids, CNet & Technology Tell, we're expecting the VersaStand to be a popular edition to our growing range of iPad stands. The VersaStand comes in two different variations - the VersaStand for iPad and the Universal VersaStand for all other tablet types. Also, we have a few items that are now available in different colours and sizes! Firstly, the Evoluent VerticalMouse 4 has a new family member- The Evoluent Mouse 4 Small. The Evoluent Vertical Mice are already a popular product so I was very happy to hear that we now stock the small version so I can now join in and have one too! There is good news as well for Mac users - we also now have the Evoluent VerticalMouse 4 made specially for Macs. It is wireless and has Bluetooth. Available in right handed onlyand black or white. You can view the Vertical Mouse 4 Small here and the Vertical Mouse 4 Mac Bluetooth here. Speaking of colourful things, the Ongo seat has now also got brighter! Now available in 12 fun colours to brighten up your office this summer. Wherever you want to sit more actively and enhance your health - and have fun at the same time. You can view the Ongo seat here. Lastly we have also got new additions to the HAG Capisco Puls chairs - we now also have the 8020, 8001 & 8002 ergonomic active sitting chairs. You can view the Capsico Puls chairs here. Watch this space for even more new products arriving on site in the coming weeks!